Still lifes Khrutsky really surprising. He tries to give his work a rather complex composition. On his canvas in a fancy way, a huge amount of vegetables and fruits are collected. It must be remembered that the artist invented pictures. He never wrote them from nature. That is why his canvas just breaks from fruits and vegetables. 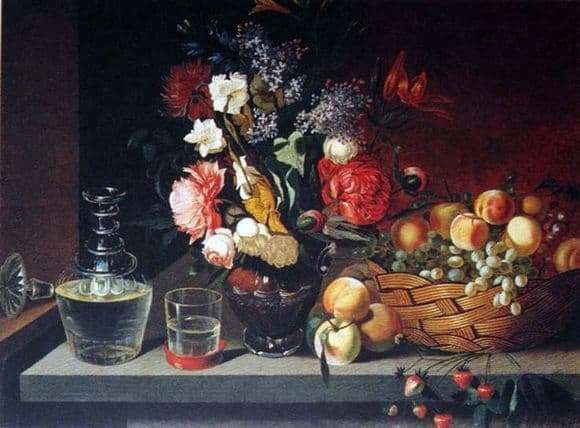 The time of ripening of fruits collected in one still-life is different, therefore they simply cannot lie on the same table. The same can be said about flowers. His paintings are truly fabulous. Most of the contemporaries of the painter wanted to have at home still lifes of this talented painter. Before us is one of such unusual works. Khrutsky highlights a bouquet of flowers. It consists of peonies with large petals, luxurious roses, rich irises, tulips, ears and stems. It occupies the entire center of this canvas. A basket with fruits and berries is to the right of the bouquet. Here is the usual glass in which water is poured. There is also a slice of lemon. This detail is necessary in order to emphasize the density of ceramic products. The viewer sees real abundance. The artist does not regret the rich colors in order to depict fruits, berries and flowers as naturally as possible. They are so tangible that it seems enough to reach out and you can try the fruit you like. The background in the picture is deliberately dark. This is necessary in order to emphasize the ripeness of berries and fruits and the magnificence of fresh flowers. The picture creates a joyful mood in the audience. She is all imbued with bright colors that are pleasing to the eye. The painter was able to create truly impressive still lifes. He is a true master, who subtly feels the colors of nature and knows how to choose the perfect tones in order to portray fruits and flowers as naturally as possible.